Why is my ice maker making hollow ice cubes? Drinks don’t get cold enough with hollow ice cubes and the ice melts almost instantly after contact with liquids in the glass. One reason may be that your Whirlpool refrigerator has an incorrect freezer temperature or may have inadequate water flow. Either problem is relatively easy and inexpensive to correct. The temperature in your freezer may be either too cold or not cold enough. This depends on how high or low you have your freezer thermostat set. Getting your freezer to the correct temperature is simple, just use a thermometer. Place the thermometer in the freezer for 10 – 12 hours, check it and adjust the temperature, wait another 10 – 12 hours and follow the same procedure until your freezer is set at 0 degrees Fahrenheit (-18 degrees Celsius). Another possibility is that your thermostat has gone bad. Not all refrigerators have thermostats, some have a timer. You will need to check your manual to determine which of these parts your refrigerator is equipped with. If your refrigerator has a thermostat it is possible that it is cycling too soon and your ice will not freeze solid. 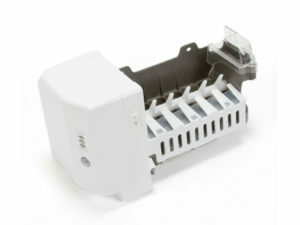 Check your manual to find the correct thermostat for your Whirlpool model refrigerator. Replacing the thermostat will be explained in your manual. If you would rather not do this repair yourself call a qualified appliance repair person. A defective water filter could also be the problem. It could be that it needs to be replaced because it is not supplying enough water to your ice maker. Water filters should normally be replaced every 6 months. Finally, if everything checks out ok, pull your refrigerator away from the wall and look at your water line to make certain it is not kinked or maybe frozen. If it is frozen you will need to turn off the water shut off valve. You can defrost the line with a hair dryer or heat a wet bath towel in the microwave and wrap it around the frozen water line letting it thaw out. Again, if all of this seems a bit daunting and you do not feel compelled to do it yourself, check with a qualified appliance repair person. Why Is My Icemaker Making Hollow Ice Cubes. Hollow ice cubes don’t get your drinks cold, they melt almost immediately after filling your glass, quite frustrating! Two of the main reasons your ice cubes are hollow are: 1. incorrect freezer temperature or 2. inadequate water flow. Either problem is relatively simple and inexpensive to correct. The freezer temperature may be either too cold or not cold enough. It depends on how high or low you have your freezer thermostat set. To get your freezer to the correct temperature you should use a thermometer. Place the thermometer in the freezer for 10 – 12 hours, check it and adjust the temperature, wait another 10 – 12 hours and follow the same procedure until your freezer is set at 0 degrees Fahrenheit (-18 degrees Celsius). It is also possible that your thermostat has gone bad. Not all refrigerators have thermostats, some have a timer. You will need to check in your manual to determine which of these parts your refrigerator is equipped with. If your refrigerator does have a thermostat it may be that it is cycling too soon and your ice will not freeze solid. Check your manual to find the correct thermostat for your brand and model of refrigerator. Replacing the thermostat will be explained in your manual. If you would rather not do this repair yourself call a qualified appliance repair person. Another possibility for the problem with hollow ice cubes may be your water filter. 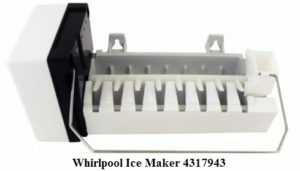 It could be that it needs to be replaced because it is not supplying enough water to your ice maker. 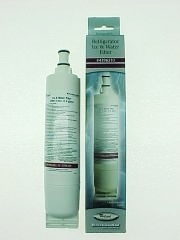 Water filters should normally be replaced every 6 months. Finally, if everything checks out ok you should pull your refrigerator away from the wall and look at your water line to make certain it is not kinked or even frozen. If it is frozen you will need to turn off the water shut off valve. You can defrost the line with a hair dryer or heat a wet bath towel in the microwave and wrap it securely around the frozen water line until it thaws out.